On Tuesday evening, conference attendees will have a unique opportunity! We will be visiting the Cathedral of Saint Paul, National Shrine of the Apostle Paul, and celebrating a special Mass together. A tour of the Cathedral and a reception will follow. 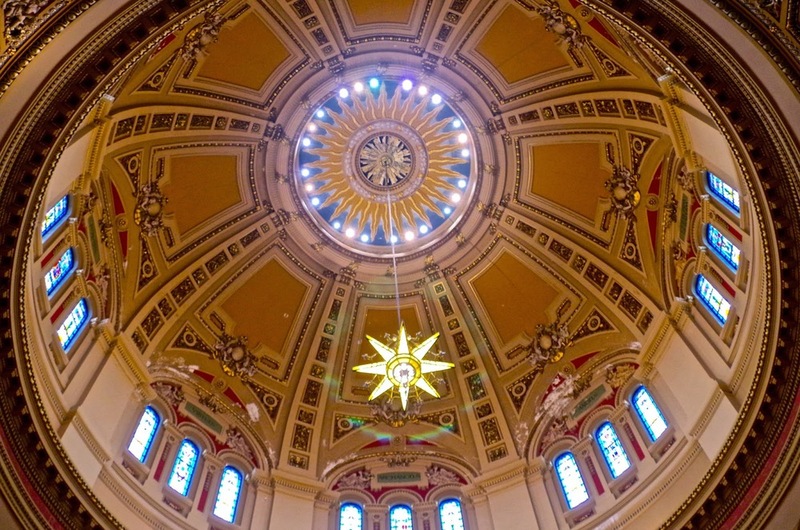 Click here to take a virtual tour of the Cathedral of Saint Paul. Or take the 360° Panoramic Walking Tour. This the fourth building to bear that name, the Cathedral of Saint Paul was the dream of Archbishop John Ireland, who secured the site in 1904. The Archdiocese was growing and Ireland saw the need for a "great Cathedral" to replace the third Cathedral, which was 46 years old at the time and too small for the growing congregation. One of the finest examples of Beaux Arts architecture, the Cathedral was designed by E. L. Masqueray. The cornerstone was laid on June 2, 1907. The first liturgy was held on Palm Sunday, March 28, 1915. Work continued on the interior for decades. On October 14, 1958, it was consecrated by Archbishop William O. Brady, securing its place among the premier houses of worship in the United States. It was placed on the National Register of Historical Buildings in 1974. The Cathedral dominates the Saint Paul skyline and is situated on the highest point in downtown Saint Paul, Minnesota. The waves of immigrants that flooded into Minnesota in the late 19th and early 20th centuries fueled the diversity that the archdiocese still enjoys. The Cathedral of Saint Paul has always been an open and welcoming community of faith. The Shrine of the Nations is a testament to the important roles that immigrant communities have played in the history of the Cathedral. These shrines surrounding the sanctuary honor saints who were important to the many different ethnic communities that helped to build the Cathedral that we see today. The Cathedral of Saint Paul has been made by many hands, from the initial sketches made by Masqueray, to the immigrants who contributed to the construction, to the artisans and designers who have carried on the task of embellishing the church during the last 85 years. It is truly a fitting testimony to God and a sacred place where all people can appreciate its magnificence and worship with uplifted hearts. Click here to watch a brief video of the history of this breath-taking house of prayer. 1680 French missionary Father Louis Hennepin is abduced by Native Americans and uses this providential "opportunity" To be the first to preach the Gospel of Jesus Christ in Minnesota. 1840 Father Lucien Galtier arrives in the frontier settlement of “Pig’s Eye” to establish a permanent Christian community in the upper Mississippi River valley. 1841 Father Galtier oversees the construction of a primitive log chapel dedicated to the great missionary Apostle Paul and succeeds in having the settlement renamed Saint Paul, later designated as the state’s capital city. 1850 Blessed Pope Pius IX creates the Diocese of Saint Paul appointing Bishop Joseph Cretin, friend of Saint Peter Chanel, as its first bishop. 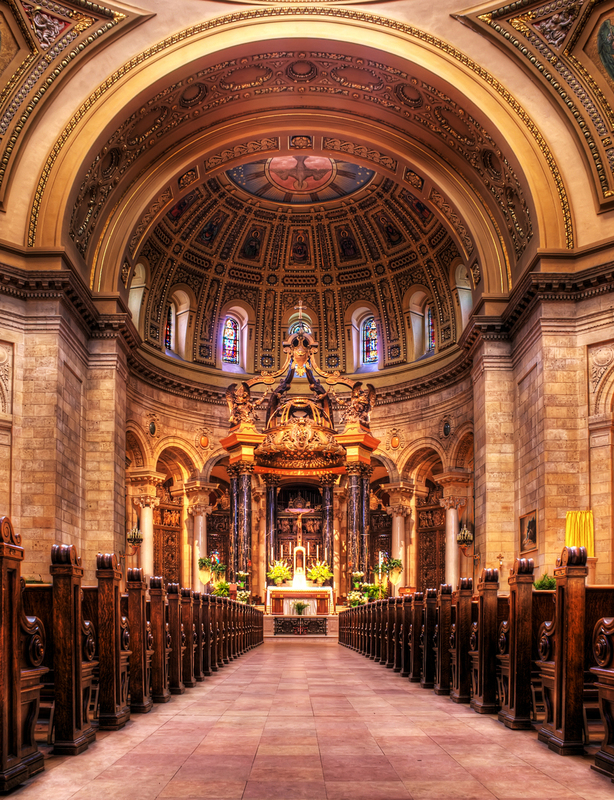 1907 The cornerstone of the current Cathedral of Saint Paul is blessed by Archbishop John Ireland, beginning the process of building one of the largest cathedrals and greatest monuments of Beaux-Arts architecture in the United States. 1915 The first Mass in the fourth Cathedral of Saint Paul is celebrated by Archbishop John Ireland on March 28, Palm Sunday. 1936 Eugenio Cardinal Pacelli, later elected Pope Pius XII, visits the Cathedral of Saint Paul. 1958 After more than half a century of construction, Archbishop William Brady solemnly consecrates the great church in a five-hour ceremony. 1974 Cathedral of Saint Paul is added to the National Register of Historic Places. 1984 Joseph Cardinal Ratzinger, later elected Pope Benedict XVI, visits the Cathedral of Saint Paul. 2008 Pope Benedict XVI opens the jubilee “Year of Saint Paul” in honor of the 2,000th anniversary of the birth of the great apostle—the first time someone other than the Lord Jesus or the Blessed Virgin Mary is universally honored by the Church in this way. 2009 The Vatican and the US Conference of Catholic Bishops designates the Cathedral of Saint Paul as the National Shrine of the Apostle Paul, following a request by Archbishop John C. Nienstedt. 2012 The Vatican establishes a “bond of spiritual affinity” between the Basilica of Saint Paul Outside the Walls in Rome and the Cathedral of Saint Paul. This means that we can make a pilgrimage here and enjoy all the spiritual benefits as if we were able to pray at the tomb of the Apostle Paul in Rome. As a sign of this spiritual closeness, the Cathedral receives the gift of a stone taken from the tomb of Saint Paul.